If you intend to replace you’re 765 grips......DON’T. The throttle side grip is infused permanently with the metal. Nothing......and I mean nothing, NOTHING is gonna remove that grip from the bar. Nothing. I’m 4 hours in and I’ve got nothing. I’ve tried heat, grease of all nature’s, razor blades, razor blades to the skin of the metal and virtually every abasive I’m aware of. This thing ain’t comin off. I’ve arranged for a tow but.......heads up. Ha! Thanks man. I’ll try one more time tomorrow but for those here they really should be aware of the the Titanic job this may be. Naw.... 9 or 10 hours in and I’m no closer to getting the grip off than I was when I started. I can force little 1/100 inch snipettes off here or there but nothing more. I can gouge and scrape into the metal before I can get the glue lose. It’s just mondo beyond belief bonded. I’ve even tried a blow torch. I’m screwed. It’s safe to say the right hand grip on a 765 is NOT removable without replacing the entire bar. As a side note and for perspective...the left hand grip came off and the new one installed in 45 seconds..
Super bummed to see the trouble you've had, Joseph. I looked at it last Thursday night and just said "no." Put it right back on with the intention of tackling it again with at least 4 hours free. It looks something like a co-molded part, so there's no "peeling" off. And from what I understand there are grippy raised parts of the throttle tube that also need to be sanded down - for feel and also for diameter. One thing that I see from the photo though, is that it looks like you didn't unscrew the throttle housing, to remove the throttle tube/grip off the handlebar. Don't see that it will make the actual job any easier. Xorbe, the throttle tube is plastic but has the rubber grip overmolded or co-molded to it - it's not a glue job that you can heat/peel/cut off. 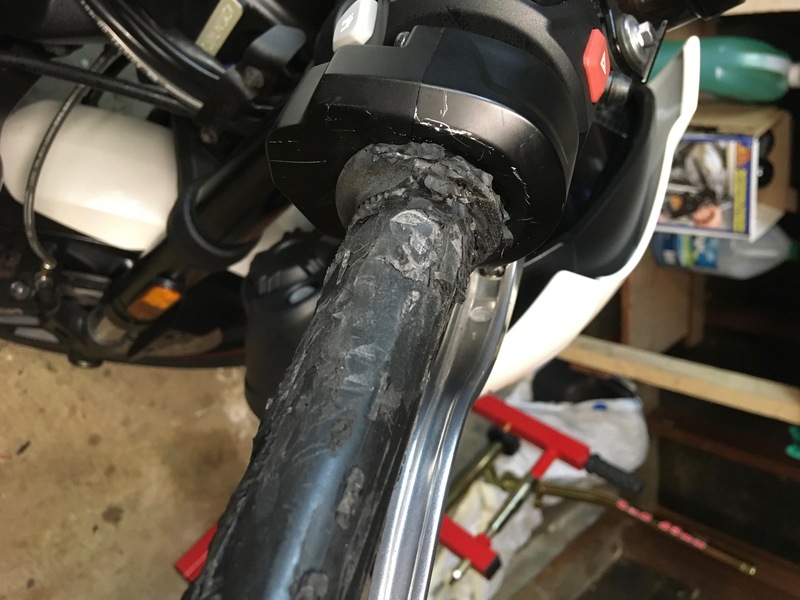 The thread on the Oxford heated grips install talks about it some more. According to all those folks it is doable, it is painful, and it is not something that anyone wants to repeat. The left side grip is also on a plastic tube, but is not similarly molded. As Joseph said, you pull that thing off easy as any other, and a new grip just slides on.